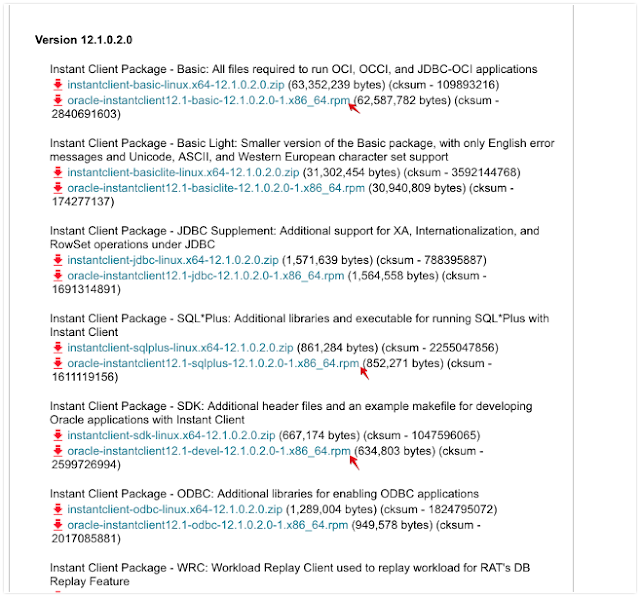 This post is written to show how to build Openshift PHP builder image that are using Oracle database connections, specifically using PDO-OCI extension. OCI8 connection is also being prepared. 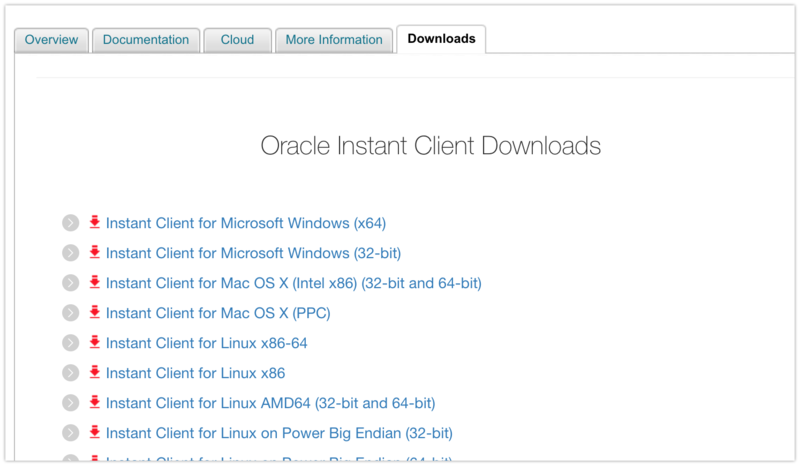 Checking the 5.6/root directory, there is a file that shows the required Oracle instant client rpm files. 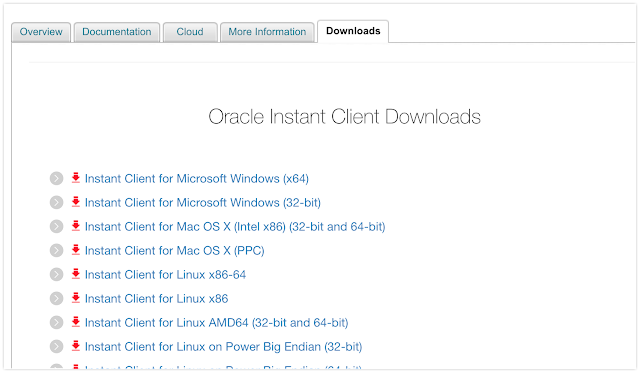 Then we need to download instant client from oracle. This is complicated by Oracle insisting us to sign-in using OTN Account. 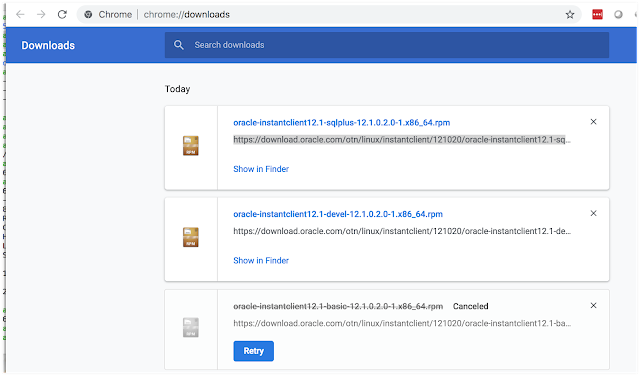 Open your browser and point to "https://www.oracle.com/technetwork/database/database-technologies/instant-client/downloads/index.html", click on "Instant Client for Linux x86-64". Click Accept License Agreement, then proceed to click the required rpm files (basic, devel, and sqlplus for 12.1.0.2 version). Do a dummy download using your browser (at this point Oracle would ask for your Oracle Account / OTN login, which we could request at no charge) and then copying the Link Address from browser, so we could use the Link Address URL in our wget commands. The Url is obtainable from the Chrome's Downloads menu. Right click and choose 'Copy Link Address'. aws@broker root $ wget "https://download.oracle.com/otn/linux/instantclient/121020/oracle-instantclient12.1-basic-12.1.0.2.0-1.x86_64.rpm?AuthParam=1542707896_f8e27ebee187829c54ba8692f79d720c"
aws@broker root $ wget "https://download.oracle.com/otn/linux/instantclient/121020/oracle-instantclient12.1-devel-12.1.0.2.0-1.x86_64.rpm?AuthParam=1542707982_0f69007df1efaa246b884e175eb1e7b9"
aws@broker root $ wget "https://download.oracle.com/otn/linux/instantclient/121020/oracle-instantclient12.1-sqlplus-12.1.0.2.0-1.x86_64.rpm?AuthParam=1542708072_4faad0ac9a5562e854f08cadee1d87a8"
aws@broker root $ cd ..
aws@broker 5.6 $ docker build -t s2i-php56-pdooci . 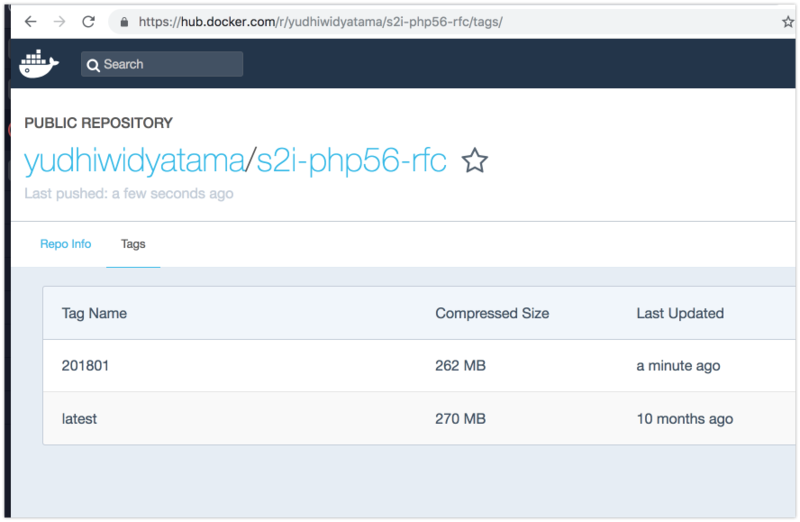 Step 3 : ENV SUMMARY "Platform for building and running PHP $PHP_VERSION applications" DESCRIPTION "PHP $PHP_VERSION available as docker container is a base platform for building and running various PHP $PHP_VERSION applications and frameworks. PHP is an HTML-embedded scripting language. PHP attempts to make it easy for developers to write dynamically generated web pages. PHP also offers built-in database integration for several commercial and non-commercial database management systems, so writing a database-enabled webpage with PHP is fairly simple. The most common use of PHP coding is probably as a replacement for CGI scripts." The image pushed successfully to Docker hub. Now I will try to describe the Dockerfile modifications (line 48-60). The harder part is how to create the oci8.so and pdo_oci rpm, which would be described in another post.. This post shows the steps required to build your own Openshift Builder images. This might be needed when you need to connect to Oracle database using PDO extension, or there is additional command you want to be available in your application pods. If you simply need additional extension that are readily available, there is an alternative simpler step involving the use of S2I assemble script (see http://inventorsparadox.blogspot.com/2018/04/installing-apcu-extension-in-openshift.html). But if the extension need nontrivial dependencies, please read the remaining of this blog post. We are going to need Docker toolset available. For Mac users, you could use Docker for Mac. For Windows users, there is Docker for Windows. I will show the screenshot from Docker running on CentOS Linux. You also going to need git (https://git-scm.com/download/win or https://git-scm.com/download/mac). Receiving objects: 100% (1201/1201), 121.52 MiB | 16.52 MiB/s, done. Resolving deltas: 100% (519/519), done. Branch rfcfull set up to track remote branch rfcfull from origin. aws@broker 5.6 $ docker build -t s2i-php56-rfc . Post http:///var/run/docker.sock/v1.19/build?cgroupparent=&cpuperiod=0&cpuquota=0&cpusetcpus=&cpusetmems=&cpushares=0&dockerfile=Dockerfile&memory=0&memswap=0&rm=1&t=s2i-php56-rfc: dial unix /var/run/docker.sock: permission denied. Are you trying to connect to a TLS-enabled daemon without TLS? So the build was a success, now we only need to publish to Docker Hub. It actually isn't a mandatory to publish to docker hub, but the alternative is to publish to Openshift Internal Registry which is not quite simple. In this blog I have shown how to build a rfc-enabled PHP 5.6 S2I image using docker and upload the image to dockerhub. Actually I haven't discussed how to actually modify the docker image. The modification is in the lines 48-70 of the Dockerfile file. Note that the tar.gz file must be put in the same directory as the Dockerfile (check the github repo for resulting tar.gz). Afterwards, install PHP 5.6 development package with the required compatibility library. The compilation process is done using phpize, configure, and make install. And that is how you customize the Dockerfile.